The Big Picture on America’s Fiscal Crisis II. How Urgent? will inexorably lead to a breakdown of the Democratic-welfare regime which has lasted from 1932 until the present. The reasoning is very simple and direct. We already have huge debt. Rapidly increasing entitlement spending on our rapidly increasing number of retirees will keep driving our debt higher and higher. We won’t be able to grow our way out from under this debt because we have run out of industrial revolutions to spur new growth. 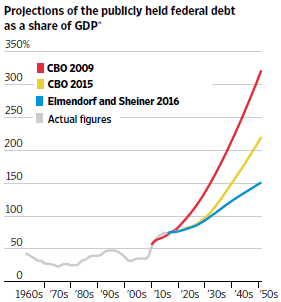 The above chart shows, for example, that the public debt may not reach 100% of GDP until 2032 instead of the earlier CBO prediction of 2030. I believe that this Elmendorf projection should be viewed as false comfort. Both health-care inflation and low interest rates are a direct result of very low overall inflation in the U.S. and this will not last forever. Low interest rates mean that interest payments on the debt are also very low. This is a very poor reason to increase current borrowing. When interest rates do go up, whether it is sooner or later, interest payments on the debt will increase by hundreds of billions of dollars a year over a likely relatively short time period. This is the severe crisis, or Fourth Revolution, which Mr. Piereson is predicting. We don’t know when it will occur because we don’t know when inflation will rear its ugly head. Wouldn’t it be much better to put our debt on a downward path, as a percentage of GDP, and avoid the otherwise very unpleasant consequences? This entry was posted in CBO, Congressional Budget Office, Douglas Elmendorf, economic growth, inflation, interest rates and tagged congressional budget office, debt, deficit, economic growth, health care inflation, interest rates, jack heidel, Wall Street Journal by jackheidel. Bookmark the permalink. Is it my deaf ears or is it really true that the political process, now in full bloom, has totally ignored the fact that our nation’s debt per citizen in a few years will be same as it is Greece today? Your ears aren’t deaf. The problem is so great that nobody wants to deal with it. All of the presidential candidates, including Bernie Sanders, will recognize the problem when pinned down. But then they want to change the subject in order to talk about more tractable problems which they can offer solutions for.